*Individual results may vary and some patients may require periodic follow-up treatment. I’m so thankful I found your website! I tried the product and it didn’t seem to be working, that’s because I wasn’t doing it right. I followed the correct way to do it and it worked!! I am so much happier! I have never seen my tongue red. Ever. My mouth usually tastes gross and now well not sure I’m not used to this! Lol. I’ve always been afraid to talk to people without gum or mints in my mouth or get close to anyone. I still get afraid, I guess this will come in time. I have tried everything, therabreath, coconut oil pull, charcoal, etc. I go to the dentist regularly. I brush and floss constantly, nothing worked. I still worry about my breath but I think it’s because Ive been dealing with this since I was 15 and I’m now 50. I do the regimen constantly throughout the day. I hope it stays this way. I wish I was closer to the company so I could see Dr. Miller and actually cure it. It’s so funny I go look in the mirror just to look at my tongue now to see if it’s red! I love that! I just can’t believe it. It’s a miracle. Thank you so much!! You’re the best!! I can’t believe I’m writing to you so soon!!! Over 20 years of having bad breath I thought this was my last try for a cure! I’ve done therabreath, pro fresh, herbs, peroxide and baking soda, all types of mouth washes….you name it I’ve tried it. Even charcoal!! Essential oils, coconut oil pulling. Long story short…I found you on facebook. Saved the info and finally decided enough is enough! I went to ENT, had camera in my stomach to see if maybe I had cancer in there. I had to just try for myself! I flew in Monday 12/12/16 for seen by Dr. Miller. I instantly felt comfortable! April was such a wonderful person and made me laugh and feel at ease. I got checked out….followed up next day. (I have to admit not so happy this morning since I was instructed not to brush, no gum, no mouth wash!) good thing I could walk from hotel I stayed at. I got 2 treatments of tongue rejuvenation. Got mouth cleaned….and Dr. Miller took out a tonsil stone I had in the back of my throat! I flew out that Thursday morning! Husband came to pick me up with 2 other people who for one this young boy would ALWAYS cover his nose! He didn’t this time!!! I went to see this business partner who always does the same thing. I was sooo confident I was sitting up close! Me!!! What people don’t know is it was so bad I can’t tell you all the things that were done to me! One time I went to the grocery store and bought some things. The cashier literally picked up a toothpaste and said, Here – For free!!!! I have to give God the praise and glory!!!! I prayed, I seeked, I was reading Mathew 8;3! And God healed me!!! I am so grateful and excited to finally live my life to the fullest! *I have had bad breath for years and I’m only 28. I have tried everything imaginable. I have spent a lot of money on mouthwashes that promise relief, home remedies, herbs, and doctors and dentists. I went to the ENT doctor to see if I had tonsil stones and he found nothing. I saw a stomach doctor and she ran a number of tests but couldn’t find anything. I still have bad breath and it is getting worse. I was planning on meeting my long distance boyfriend but I really don’t want him to find out about my problem. That is what drove me to see you. Your breath counselor was most kind and answered all my questions and reassured that you were more than just a place that gave out mouthwash and toothpaste. So I decided to use some of my savings and fly to your office. I was not disappointed. From the first few minutes Dr. Miller put me at ease and told me that if I had treatment, I would be cured. Things were a bit “hairy” with my gag reflex, but Dr. Miller got the work done in the predicted time. I left for home with new found confidence and did meet my friend. I want to thank all the team at the National Breath Center. I would not be who I am without your help. I can only hope that someone will see this testimonial and follow through. Whatever your problem and whatever you have to go through to get there and have the treatment done, you will emerge a new person. It was worth every dollar I spent and would recommend it to any one with bad breath. *Where to begin. At age 13 it started. I’m now 52 and really challenge myself on if I can endure this much longer. I am a SUPER clean person, educated, extremely nice, polite, well dressed, jog 3 miles a day and told I’m handsome. People WANT me to succeed, but their support can only go so far. I’ve been terminated from jobs (bank manager) due to employee complaints. I’ve always treated my employees with utmost respect and support, but how can they follow a leader with such offensive breath. I am divorced, my ex wife just couldn’t handle it after 20 years. I have become a recluse, and find my days doing anything I can to avoid close contact with people who WANT to be around me, but I just can’t put them through it and lose their friendship. I’ve tried EVERYTHING under the sun and spent thousands on ‘cures’ I am truly at the end of this. This was my story until I called your office and came in for treatment. After the Tongue Rejuvenation procedures, I have been bad breath free for over one year. I am planning to come back in for a checkup in the near future, but just wanted to say THANK YOU!!!. You gave me my life back. *Until a year ago, I had so much embarrassment in my life from my bad breath that I thought I was doomed to suffer in silence with a problem that no one else knew how serious it was ruining my life. I was a loner caused by a condition that I was told, “wasn’t there”, “it’s all in your head”, “you’re making too much out of it”. Or worse, “do better oral hygiene” because everyone knows bad breath is caused by a dirty mouth. When I brought it up with friends and even my sister and mother, they were too “polite”, if that’s the correct word, to tell me. One day at work, I found a book hidden underneath a bunch of papers. It was titled “Beating Bad Breath – The Cure”. Of course, I had been living with bad breath since middle school when a friend just blurted out “Your breath stinks”. While that left a huge hole within me, because my parents did not understand, I had to go through high school and college with no relief. When I got my first job, about 10 years ago, I used part of my first salary to buy a whole set of products advertised on the internet as a cure. But they weren’t. They did work somewhat but I needed to use them every 3-4 hours. So I thought I had at least found a way to control my problem. But then, about two months later, they stopped working. The research I was doing implied that maybe my bacteria were getting used to the products. So I bought more and more professional strength bad breath mouthwashes but after a time, they stopped working. I even tried alternating them, but it was no use. I did my best to resign myself to offending others and living alone. Then I decided to call the author of the book, Dr. Richard Miller DDS. I spent a lot of time talking with Karin, the breath counselor and she could not have been nicer. She told me that my problem was seen almost every day at their office and reassured me that if my bad breath could be cured, Dr. Miller would be able to do it. So I decided to take the plunge. I reserved a time for diagnosis and treatment and flew to Dr. Miller’s office. To make a very detailed story short, Dr. Miller diagnosed my problem and began to treat it that same day. Within the first few days I noticed a big difference and by the time treatment was over I passed all the tests I had miserably failed during the diagnostic visit. I left with a tremendous boost to my confidence. And when I returned three months later to get checked, I was doing great. Before I recommend Dr. Miller and his treatment, let me say two things. First, at the beginning I thought it was a bit too expensive for me as I work in an office. But after three days, I knew it was worth it. The fears of being close to people evaporated as the treatment progressed. Second, my life has changed so much that I can recommend Dr. Miller and the National Breath Center for anyone who has a long standing problem with their breath as I did without reservation. So, for me, the value of no longer being afraid of being close to people was worth the cost. And now, almost one year later, I am celebrating a promotion and a new boyfriend. Thanks to all the people at the National Breath Center. *My name is Patrick. I am fifty-nine years old and hail from Liberia, on the west coast of Africa. 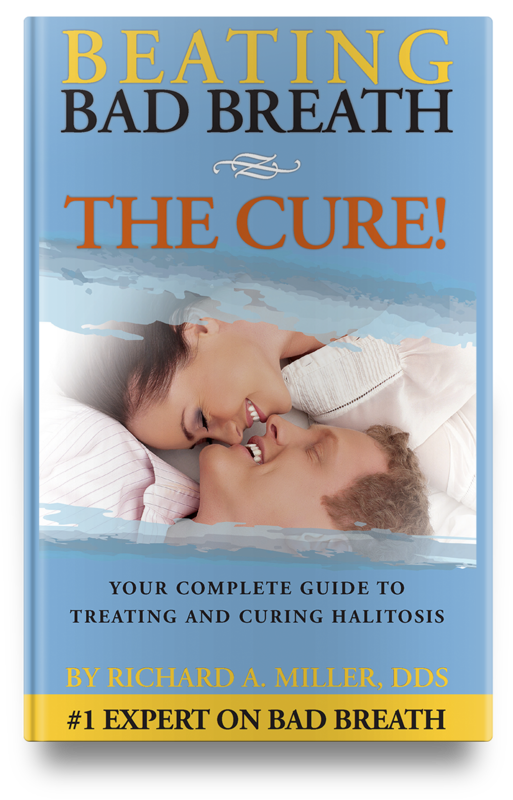 I am pleased to share my life experience as regards living with Halitosis. Which I may guess dates back as far as in the early 1980’s when one of my best friends offered me toothbrush. Halitosis is not something that one expects or anticipates to be afflicted with. Hence, during my course of life I had confidence in my breath until l started seeing body languages, or body defense mechanisms, such as many stepping backwards, putting their hands to their nose(s) while in conversation with me. Others offered me mints, gum, while the ones that smoke will immediately light a cigarette if they have to engage me in a conversation, whether they felt like smoking or not. These were all signs that something was wrong with my breath, from the early 1980’s to March 09th 2016, when I got cured of my severe halitosis by Dr Richard Miller DDS. I don’t remember anyone, be they a friend, family member, wife, any of my children, or work mate(s) ever said something to me about my bad breath. But simply resorted to body defense mechanism as mentioned above. A best friend of mine during the early 80’s offered me a toothbrush, with no justification, buttressed with laughter. I took note of his action towards me, felt humiliated but didn’t say a word to him. During my studies at the University of Liberia, where I graduated from in 1983, two of my classmates extended me an offer, of us studying in group. I didn’t care much about it cause all along I studied all by myself. They persuaded me that it was an easier way of studying. As we discuss the subject matter in group and move on to various topics etc. I reluctantly accepted the offer. We met as planned. As we began discussion in a tiny bedroom. When I tried to explain something they both stared at each other. I guess it was my foul breath. I immediately began to start suspecting that something was wrong with my breath. I decided not to do much talking. We proceeded with me being silence the rest of the study period. After that study class that night, I didn’t get any more offers to study in the group. In 1983 I completed my studies and started working as a Budget Analyst. We were three in our accounting office. In no time my bad breath was discovered. The usual defense mechanism was at play very often if I had to interact with anyone one of them. The word spread very quickly, and secretly that I had bad breath. I live with it in their midst, though I was miserable. I later sought greener pastures with another company as an inventory accountant. Again, in no time my bad breath was discovered. I thought of tackling it by seeing Dr Jupiter, one of Liberia’s best dentists at the time. At the time I suffered multiple toothaches. Hence I assumed that was what that was causing my bad breath. I met with Dr. Jupiter, told him my problem of bad breath, and in my lay man view attributed the problem to my toothaches. He extracted, I guess two of my tooth, with the toothache and gave me permanent filling of two of my other teeth from going bad. I left from his office, with high degree of confidence in my breath. But that didn’t solve anything. In no time in the accounting pool office, I was code named horrible, terrible, followed by laughter at the background. I had no choice but to live with it, until I traveled to the United States in July 2000. I lodged with my sister and her husband in the state of Virginia. I guess they did figure me out but as usual it’s a taboo subject. Hence, no one said nothing but to resort to their defense mechanism. After some time of staying with them, I moved on my own in the state of Maryland. I continue to work construction, where I still work. The most painstaking litmus test was as I went from project to protect without any one knowing me there I was figured out, and the word spread quickly as bush fire. Thus isolation began, as they put up their guards. They don’t hate me, but they have been for warned not to smell that bad breath of mine. In meetings they pray I don’t make any comment(s). They wink eyes to the ones sitting closer to me not to start any conversation with me or entertain any conversation from me. I knew, hence I will sit mouth shut ears open against my will. If I was constraint to make a comment they will quickly come in and say they agree with what I was saying just to have me silence. And the ones sitting beside me will be psychologically reacting like they’re going out of breath by keeping their hands to their noses. Sometimes the over reaction paints you very ugly in the eyes of all those that are avoiding you and it scares them away further. This went on for years, I even saw another dentist to hopefully address the problem, but it was to no avail. I reluctantly decided to do a Google search on bad breath. When Dr. Richard Miller’s information came out I read the literature and I could feel it that this is where I need to be. Besides the literature, the organization name, National Breath Center is self explanatory that this is where I need to be. I dialed their tel. number and got in touch with Karin. I was overwhelmed with the level of professionalism and warm reception. They were booked all through I think up to April. With patience as people called to cancel due to reasons beyond their control I was lucky to have had a schedule that commenced partly in February 2016 and ended on March 09th 2016. It was a professional, wonderful, friendly atmosphere, of treatment with Dr Richard Miller, DDS, and his staff. Before cure, my breath reading of the Halimeter read 223. A range that indicates severe halitosis. After the tongue rejuvenation, teeth cleaning of plague including flossing, my Halimeter reading read 51. Reducing into the range of undiscernible odor, which Ranges from 0 to 100. As I write, my oral hygiene has improved since I got cured of my halitosis. Thus keeping my breath fresh till I pay a follow up visit after three months. With the use of the toothpaste, mouthwash, and flossing of my teeth daily. I am very optimistic my Halimeter reading will always read between 0-100. Heartiest thanks to you Dr. Richard Miller DDS, and your professional and friendly staff. *I have had bad breath for over ten years. I have tried everything from mouthwashes to, special online products, and last month I even had my tonsils removed to see if that would help the problem but it didn’t. I was looking up different doctors online that could help me with this problem and your office came up. I was hoping that you would be able to help me with this daily struggle so I can get the most out of my life and not be hindered by this unfortunate diagnosis. I cannot describe in words how you have changed my life. Instead of focusing on my breath offending people, I am making new friends and seeing old ones. There are no more whispers in the halls or people offering me mints or gum. Dr. Miller, please keep up your great work to help others be confident and live their lives to the fullest. *I just want to thank you for treating my severe bad breath. I have had it as long as I can remember. I won’t bore you with how devastated my life was as I’m sure you’ve heard it before. No dentist I have seen could do more than sell me a different mouthwash or toothpaste and clean my teeth. With your treatment I now have a fresh start. Thank you for everything. *I have suffered with bad breath since high school, over ten years. Friends were hard to come by and many people would comment about my breath. I felt isolated. The dentists my mother took me to had no answers. She even took me to an ENT and a GI doctor, but they didn’t either. Before seeing you, things were so bad that I was shunned by my co-workers and was afraid I might lose my job. Again, I was isolated. I just want to let you know that after your treatment, I am no longer a second class person. No one is afraid to be near me. I have regained the confidence I rarely had. Thanks to you and your treatment. *I am one of the people who have sought you out for professional care. To be honest, as I told you, I was skeptical. Having tried everything, even having flown out to California to see a breath specialist, no one had been able to eliminate my problem. Traveling to see you was that important. As treatment progressed, my full taste returned, and when I walked up to the hotel clerk or doorman, no one moved away. I was finally meeting people without worry. Please accept my heartfelt thank you for curing my problem. *I never thought I’d be writing a thank-you email for bad breath. But having resigned myself to living with the problem, I came across one of your articles and decided to come see you, even from St. Louis. Your kindness and understanding were wonderful, but going out of your way to accommodate my travel was exemplary, not to mention the results of your TOTAL CURE treatment. As I head back home, I wanted to tell you that I cannot thank you enough for giving me back my confidence. Best to you and your staff. *I have been a computer programmer for eight years now. I have immersed myself in every aspect of my field so I could be a valued employee for the company that hired me. But when I went on interviews, people started backing away or covering their noses. After four interviews for which I was greatly qualified, I got up the courage to just come out and ask the recruiter why I did not get hired. He hesitated, but told me that it was my breath. So I turned to the Internet to learn what I could and found that you had written the first book on bad breath in 1995. I tracked you down, and you were kind enough to talk directly with me. So, I decided to make the trip from California. I can only say that your cure and your protocol have changed my life. I am now employed by a Fortune 500 company all because I can confidently meet and talk with people. With bad breath no longer an obstacle, they are even listening to me. Thank you for caring and all you have done. *Just wanted to let you know how grateful I am for your total cure treatment. Before I came to see you I realized that I was being held back in my entire life by the fear of others noticing my halitosis. Of course, as I told you, I could even smell it. But now, having been nine months since the conclusion of my treatment, I could not be happier. Everything has taken a turn for the best – my social life, my job, and even my friends and family. Thank you Dr. Miller. *You probably get a lot of comments but I just wanted to tell you how grateful I am. I know you remember when I came in, I brought my boyfriend with me. He had been the first person to be honest about my breath. But he did more than that! He found you and the National Breath Center. I was certainly skeptical when he told me, but after going through your most thorough diagnosis, when you told me how you could cure my halitosis, I was convinced. And, I was very glad that I could start the same day. It’s been months since your treatment and I just want you to know that I have regained my confidence. I no longer dread meeting new people or being close to people. For me that alone is a life-changing event. So, please know that you are appreciated for what you do at the Center. I am sure I am not the only one who has told you that but I just wanted you to know how my life has changed. *Prior to seeing Dr. Richard Miller; I had consulted with two dentists and two doctors about my halitosis. They were unable to determine the cause, and could not understand the stress this issue caused in my personal and professional life. Dr. Miller validated my concerns, evaluated and diagnosed the cause, proceeded with treatment, and eliminated my halitosis. Unexpected added benefits of my treatment was a renewed ability to fully taste, and thus enjoy foods. Two of my greatest pleasures, interacting with others and eating, have been restored and I’m so happy and thankful for Dr. Miller’s compassion and exceptional skill. 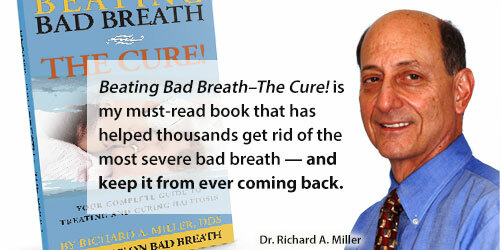 *I just got back to Dallas having had my bad breath cured by Dr. Miller at the National Breath Center. And I can’t say enough about what a positive experience it was. Dr. Miller and his staff really understood what I was going through for the last 10 years with my horrible breath problem. I know I was not the easiest patient, but they were kind and patient throughout the time I was there. I must admit, I never truly believed my bad breath could be cured. I had looked everywhere, tried every product available, and even traveled to Toronto and California. But every breath center failed at curing my bad breath. Until I came to see you. Your tongue rejuvenation and attention to my gums did the trick. My readings went from severe bad breath to no discernible odor. I just wanted to let you know that I could not be happier. Thanks again, Dr. Miller, for curing my breath problem! *It was worth every minute. I am now able to look people in the eye and be close without worry of any put-offs. The biggest change for me is work. I hadn’t received a promotion in years even though I was the most qualified nurse in my section. I just wanted to let you know that last week I got a promotion and pay increase. Thank you for getting me back to a normal existence. *I know that I was a challenging case for you, but your patience and persistence made me feel that you cared about me at all times. And now that I have been cured of my “curse”, I recommend you as the best dentist I have ever seen, even though I do not tell them what brought me to see you. So, once again, my greatest thanks. You changed my life. *All I can say is WOW! I am one of your patients who has had a bad breath problem for many years. Like I told you, it started when I was a teenager. Needless to say, my self-confidence was very low. When I graduated college and went looking for a job, I couldn’t help but notice that some of the recruiters would turn away or step back a bit when I was talking. I had previously been to see a dentist who “specialized” in bad breath in California. The only treatment I received was a number of oral care products to use at home. They even told me that I would be cured in one day. Needless to say it didn’t happen that way. While the products held off the odor, I needed to use them more than once a day just to be around people. But after a while, the odor from my breath filtered through and I needed to use them again. Through a stroke of good luck, I found you. I remember your thorough explanation about why I had bad breath and what I could do about it. So I started your program and haven’t looked back since. Now that I am cured, I just wanted to thank you again for your help. People no longer avoid me or turn away. For the first time in many years, I am no longer anxious about meeting or talking to people. Again, WOW! Thanks for changing my life. Share your experience at the National Breath Center.